Proxama a provider of near field communications (NFC) proximity marketing solutions,launched an NFC marketing campaign on Friday in a number of Vox cinema foyers in Dubai. 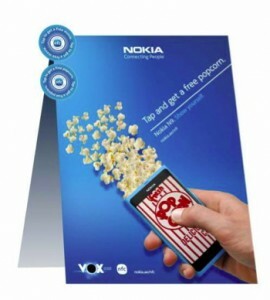 The campaign targeted cinema-goers owning the new Nokia N9 handset who were invited to ‘tap’ an NFC-embedded poster or standee (portable display stand) with their handset to download vouchers for offers including free cinema tickets and popcorn. The campaign runs until late December and will be rotated around different cinemas in the city during the campaign period to provide greater reach and to be able to better measure its effectiveness. This entry was posted on Sunday, November 27th, 2011 at 14:18 @638 and is filed under DailyDOOH Update. You can follow any responses to this entry through the RSS 2.0 feed. You can leave a response, or trackback from your own site.